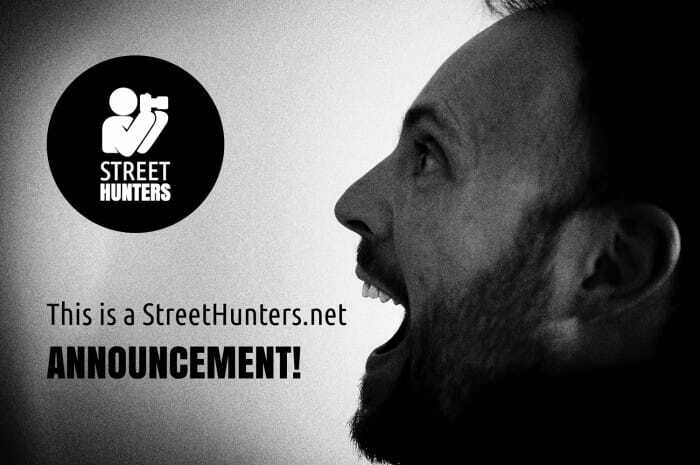 Announcing the “Hello I am a Street Hunter” video! The other day, Casper, Andrew and myself were having a chat about new creative ideas to share with you. We wanted to do something that would not only be inspiring and creative, but something that would involve you all, something that you could be apart of. So, Casper came up with the awesome idea of us making a “Hello my name is XXXXXX and I am a Street Hunter” video! We thought about it for about 1 second and that was it! We loved it! As you all know, StreetHunters.net is a website that is run by myself Spyros Papaspyropoulos, Andrew Sweigart and Casper Macindoe during our free time. We are normal, average guys that all have day jobs which take up most of our day and we all have that special time in the day that we spend with our families. 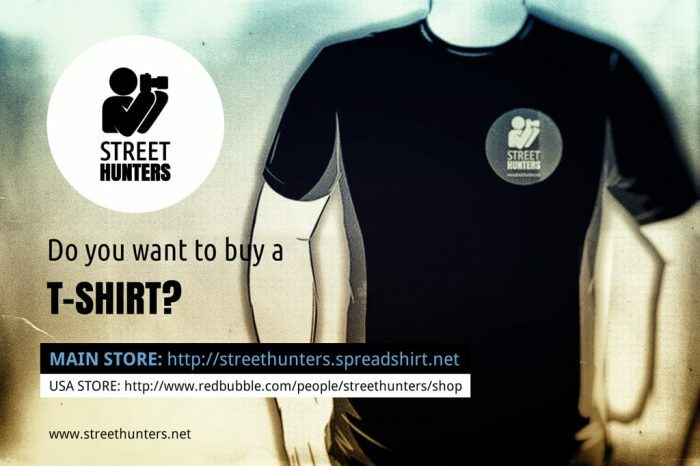 We love Street Photography and we absolutely and undoubtedly adore the little brand we have managed to make, Street Hunters! We are constantly trying our best to maintain the website through updates, blog posts and other promotions. We don’t have sponsors, we don’t have backers. We fund this little blog on our own. We have added Donation buttons under each page and we are also using Google Adsense to raise a small amount of money to support the website, but the income we make is still very little and it barely pays for the hosting. Hangout Q&A with Charlie Kirk this Sunday 21:00 C.E.T. 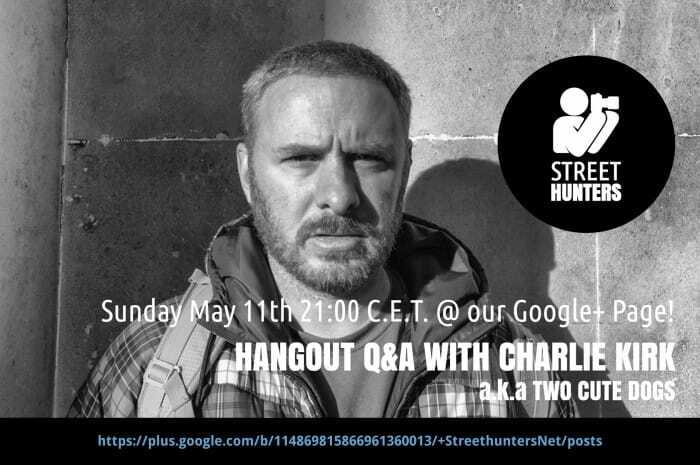 We’re really pleased to announce that at this Sunday 11th May we will be hanging out with street photographer Charlie Kirk in a Q+A session. Seats are very limited and can only be offered on a first come first serve basis. The event will be recorded and posted on our You Tube channel and our GooglePlus Page soon after the close of the Q+A. Gathering at 21:50 Central European Time for quick introductions and hellos! The Q+A will begin at 21:00 CET. Just to avoid confusions, you can check your local time for the event using a world time website such as Time.is. If you want to learn more about our Special Guest, mr. Charlie Kirk you can visit the links provided below. In an effort to aid and abet Street Huner readers, Casper Macindoe will critique your submitted image. A visual critique from his perspective. 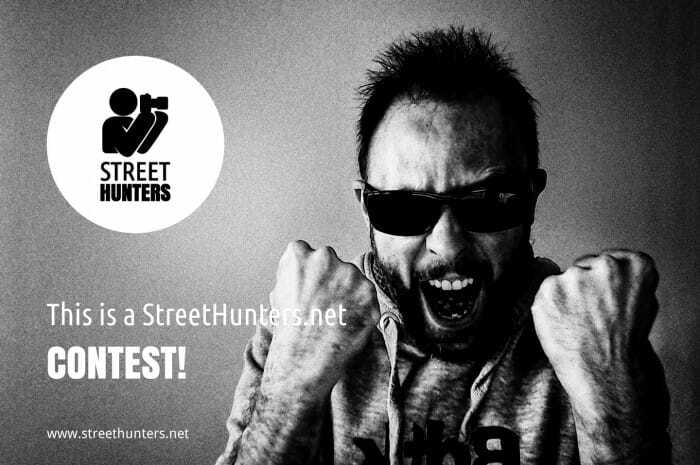 Submission will be open for 48 hours and you can submit your image for review using the email on the contact page of the Street Hunters.net website. We have a feeling this maybe a popular feature on the site so only one image will be chosen per week and the resulting critique will be posted on the site. We won’t be charging for this service although it will take time and so if you do feel the urge to donate to the site – feel free. You can find donation buttons at the bottom of all pages. 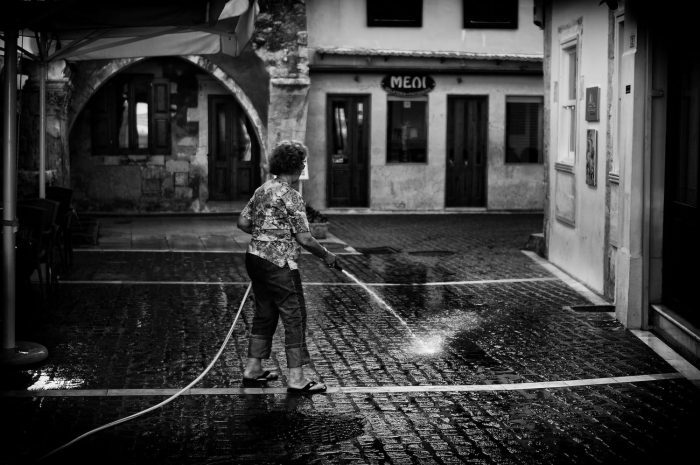 We have been here since June 2013, sharing our Street Photography knowledge and experiences with you while we ourselves continually learn. Thanks to your amazing support and your wonderful attitude, we have managed to continue to deliver new content (we hope of good quality!) every week! As you have probably understood by now, besides 1 blog post every Wednesday and 1 Featured Street Photo every Friday, we also make one video a month and try to post little things as well in between. Our Flickr and GooglePlus communities are live with activity and we are enjoying interacting with you, our fantastic readers, every single day! The experience so far has been amazing and we can’t wait to do more! 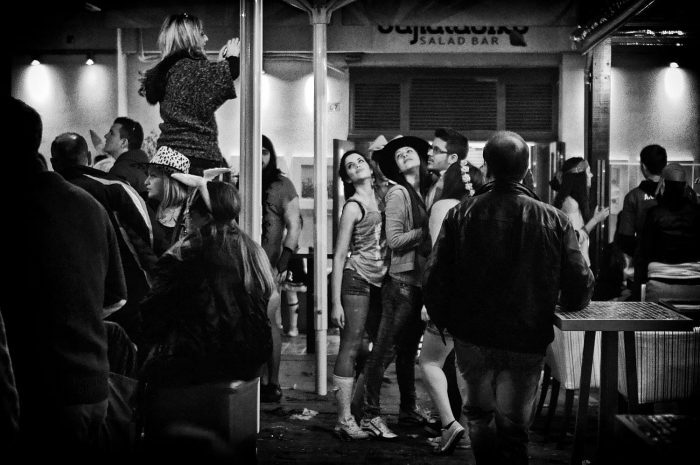 Andrew, Casper and myself are all doing this because we love Street Photography. We don’t have any real free time, we are fathers, husbands, business owners, creatives and any little free time we have we gladly invest it into the StreetHunters brand to make our website a great resource for Street Photographers all over the world. 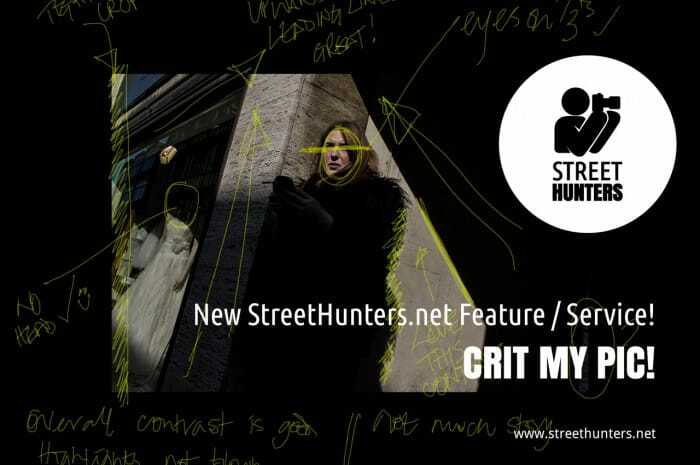 What’s NEW with Street Hunters! The five of us have decided to make some changes to our content that we hope will increase the level of interactivity of our website. We aim to do this by adding some interesting new things to our repertoire. 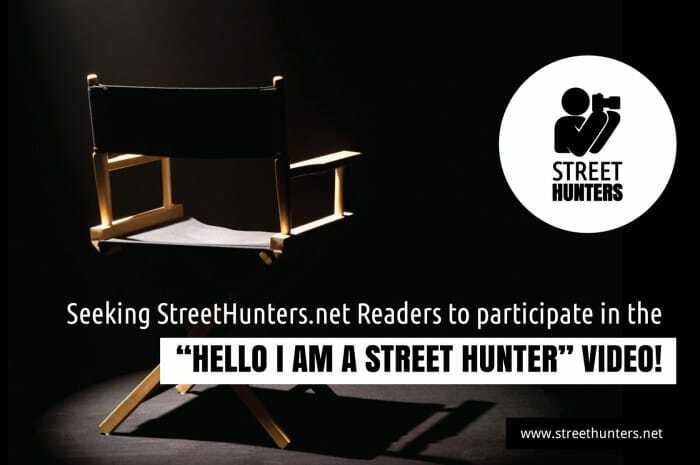 We want to make Street Hunters more engaging and fun for you, our readers, because we want to thank you for all the support you have shown us during these past months. Many friends from various parts of the world have requested to join our team during the past month. Up until now www.StreetHunters.net wasn’t ready to grow. But, the time to speed things up has come and for that reason we are letting you all know that we would love to take a look at new Street Hunter candidates! But what does a Street Hunter have to do?